Every once in the while I get punched in the face by a Samoan contradiction. I turned in my absentee ballot the day I left for Group 81’s Peace Corps Staging in Los Angeles. While the change in geographical climate from San Francisco to Samoa has been daunting, the change in political climate has been equally so. San Francisco, that bastion of hedonism, free love, bleeding hearts, and communism, is nearly as far as one can get from coolly conservative Samoa. But on occasion, the world turns. The Tahitians left for the airport at 10 tonight, so earlier in the evening my school’s staff and student prefects hosted a going-away fiafia. A fiafia is often an entertainment exchange. One group performs for the other, and then everyone switches. Rather than volleying back and forth tonight, the Tahitians performed a bunch of musical numbers, and then our students reciprocated with their own program. 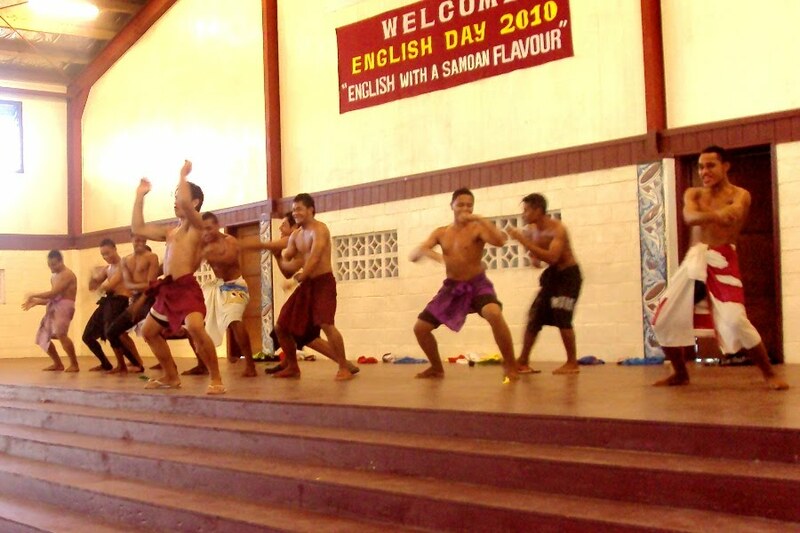 The Tahitians started off with a haka (pictured above), which I think is a Maori term (?). In any case, warriors or athletes or rugby players or whoever will stand up and perform a haka before battle or a game to pump themselves up. There’s usually chanting, shouting, whooping, and chest-thumping; it’s very male. The Tahitians had a good haka. Their fa’aluma, the guy out in front leading the chant had some amazing moves. For their second number, they wanted to sing to someone, so they asked for a female student to come up and join them. There was an awkward silence as volunteering to be the girl would have been taboo. Finally, the hormones of one girl, Ruta, beat out cultural adherence, and she stood up and walked to center stage. Now I’m unclear what happened next, but there was some quiet wrangling among students, some famous Samoan non-verbal communication was had, and then the switch happened. The Tahitian boys had just gotten into formation; one was standing at the microphone holding up his cell phone, which provided accompaniment. They’d formed a semi-circle around Ruta, but just as they sang their first notes, she stood up and walked back into the audience. Sione with style, poise, and expedience took her spot. Sione is a young fa’afafine. While he still sits with the boys at assemblies and conforms to the male uniform standards, he carries himself effeminately and, on free-dress days, often shows up in a wig, earrings, and high heels. Today was free dress day, and he was in full regalia. The Tahitians were unphased. They were fully aware of what had just occurred, but they didn’t seem to care. In fact, the same fa’aluma came from the back and did a very dramatic dance for Sione, and then took Sione’s hand and they danced together. The crowd laughed. One could argue Sione was simply a freak show and an object of entertainment. In fact, later when our kids got up to perform, the boys did a full number in drag. But Sione wasn’t one of the boys in drag; Sione was being himself. And while there was a comic element to Sione’s dance, it wasn’t taboo at all. And when it was finished, the students cheered. Coincidentally, the national Miss Fa’afafine Pageant was held last night in front of a sold-out audience. For a place so coolly conservative, there are occasional pockets of progressiveness. The fa'aluma dances while Sione swoons on the floor. Our boys doing their haka. 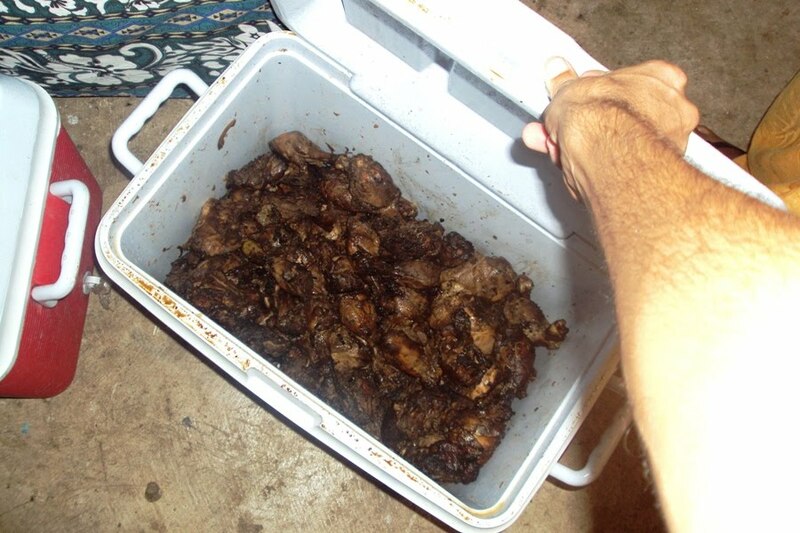 A cooler full of barbecued chickens. This is a great post Matt. You handle a critical issue with sensitivity. Thanks for sharing. This post had me in fits of laughter! Thank you Matt!